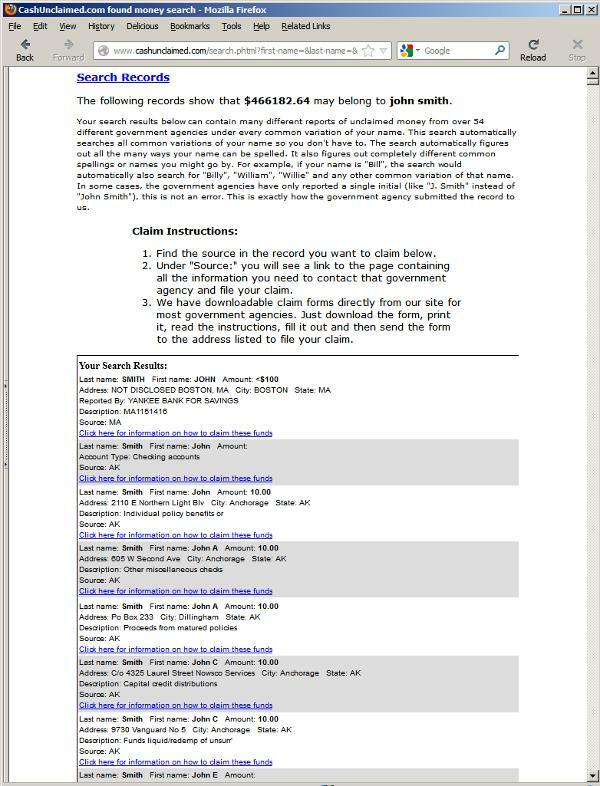 "Find and Claim Money For You & Your Family"
CashUnclaimed is a private source of unclaimed money records from all 50 states & many Federal agencies. We are not an official government agency. Because we're not a government agency, it allows us to collect information from a huge variety of sources. So instead of having to search dozens of government sites to find your money - you can search all these records from one location on our site. Believe it or not, there is no single government unclaimed money search for all these sources. That's what makes our search so valuable! When you perform a free trial search we display the total dollar amount in unclaimed funds that we show reported by the appropriate government agencies. This does not guarantee that this money is 100% absolutely yours. What it means is that there is that total dollar amount shown by government agencies under your name and common variations of your name. It means there are funds matching your name and they are eligible to be claimed. The dollar total we display is the actual total amount we have listed in our database. You will need to perform your own due-diligence & verify these funds listed are for you and not for someone else who shares a name with you. Click here to learn more about our database and your free trial search . Enter your first and last name in the form above. We will search our entire lost money database and return the amount of unclaimed money we locate which may belong to you. CashUnclaimed.com contains one of the largest databases for unclaimed money in the world. Our current database lists billions of dollars in unclaimed money, property, accounts and assets from all 50 states and several Federal agencies that could belong to you. Find unclaimed money property and assets for yourself, your family and friends. You will have unlimited access to our unclaimed funds property records for the life of your subscription. Many people have found money with unclaimed and lost money searches just like this one. Unclaimed funds searches like this have even been featured on T.V. After you become a member we'll also provide you with one complementary full-service live 1-on-1 session with our professional money detectives. They know how to find ALL your available money and not miss a thing! This goes WAY beyond other sites which just offer you a simple search box and nothing more... your money detective is a professional asset recovery agent! They'll help you investigate your relatives (genealogy), past addresses, work history and absolutely every piece of information that might lead to the discovery of missing money and other assets that could be hiding ina variety of places under a variety of different names. We are not an unclaimed property locator service and do not charge you a percentage of the money you claim. We are only an information service that provides you access to our huge database, information, tips, guides and help. We provide you tips and information on how to claim your money, but we do not actually claim the money for you. We believe this money belongs to you & you shouldn't have to pay a percentage to a "finder".